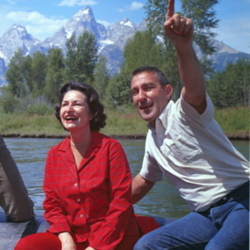 Secretary of the Interior Stewart L. Udall and First Lady of the United States Lady Bird Johnson at Grand Teton National Park in 1964. Udall was a strong supporter of the Appalachian Trail and helped with the passage of the National Trails System Act of 1968 that created the Appalachian Trail as a national park. During the first four decades of the Trail's existence, the majority of its route passed over private property. 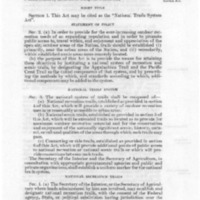 The local trail clubs and the ATC secured rights of way over these private lands through a series of agreements--some formal, some informal--that gave the clubs the right to build the trail across an individual's land, gave hikers the right to pass through, and sometimes included the right to build a shelter on the landowner's property. 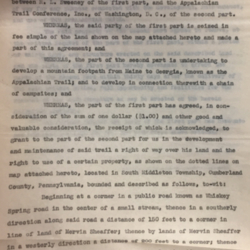 This sample easement from 1938 shows that the ATC was often able to secure these rights of way at minimal cost (in this case, $1.00). At the same time, these agreements were very fragile, generally giving the landowner the right to revoke or cancel the agreement with 30 days notice. As a result, the Trail was often rerouted when an easement was canceled, or when the property through which it passed changed hands. 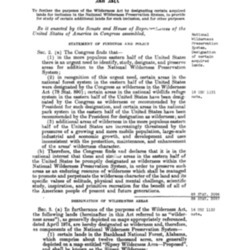 The Eastern Wilderness Act of 1975 expanded protections of the original Wilderness Act (1964) to a variety of wilderness areas in the Eastern United States. Of these, only the James River Face Wilderness in Virginia contained a portion of the Appalachian Trail, but over the coming decades a growing list of wilderness areas in the Appalachian Mountains included more and more of the Trail. We need to copy the great Appalachian Trail in all parts of America. 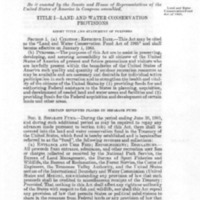 This speech spurred Secretary of the Interior Morris Udall to action, resulting first in the report Trails for America (1965) and then the National Trails System Act (1968). 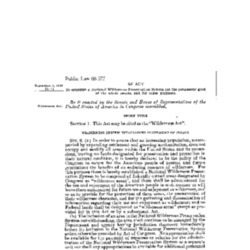 This latter legislation formalized the federalization of the Appalachian Trail. The Wilderness Act of 1964 provided federal protection for large tracts of public land deemed to be at risk. The original land acquisition for the National Wilderness Preservation System included just over 9 million acres of land, largely in the western U.S., and today includes almost 110 million acres. Written by Wilderness Society member Howard Zahniser, the Act requires that those areas added to the System be kept as free of human imprint as possible and that its wilderness character be preserved. In 1978, Congress amended the National Trails System Act to substantially increase the pace of land acquisition along the trail corridor. The Act appropriated $90 million in new funds for this purpose and led to the acquisition of private lands along more than 800 miles of the Trail. The Act also instructed the Secretary of the Interior, in consultation with the Appalachian Trail Conference, to submit "a comprehensive plan for the management, acquisition, development, and use of the Appalachian Trail." This plan was to include the "identification of all significant natural, historical, and cultural resources to be preserved." One consequence of this provision in the Act was the rerouting of the existing trail to new locations, such as McAfee Knob, that were deemed "significant" and worthy of preservation. An act to establish a land and water conservation fund to assist the States and Federal agencies in meeting present and future outdoor recreation demands and needs of the American people, and for other purposes. 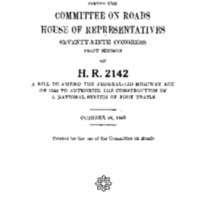 A transcript of the hearings in the U.S. House of Representatives Committee on Roads, October 24, 1945, on a bill proposed by Congressman Daniel K. Hoch (Pennsylvania) to establish a "national system of foot trails." 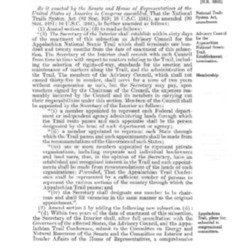 Hoch's proposal was made as an amendment to the Federal Aid Highway Act of 1944. The transcript includes the text of the amendment, as well as statements by Hoch, Myron Avery of the Appalachian Trail Conference, L. F. Schmeckbier of the Potomac Appalachian Trail Club, as well as others in favor or or opposed to Hoch's amendment. The amendment, which failed to clear the committee, would have provided $50,000 per year for the acquisition of land or easements for up to 10,000 miles of foot trails in the United States. 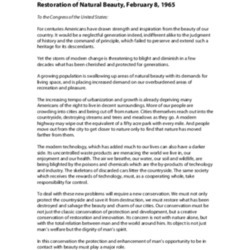 The National Trails System Act of 1968 created three types of national trails, "to promote the preservation of, public access to, travel within, and enjoyment and appreciation of the open-air, outdoor areas and historic resources of the Nation." The three trail types were National Scenic Trails and National Recreation Trails, along with associated side and connecting trails. Two of the most important of the National Scenic Trails were the Appalachian Trail (AT) and the Pacific Crest Trail (PCT). Eventually in 1978, a fourth category of trail, National Historical Trails, was added to those protected by the Act. This Act is the foundation stone of federal oversight of the Appalachian Trail, the Pacific Crest Trail, and other long distance trails such as the Continental Divide Trail.